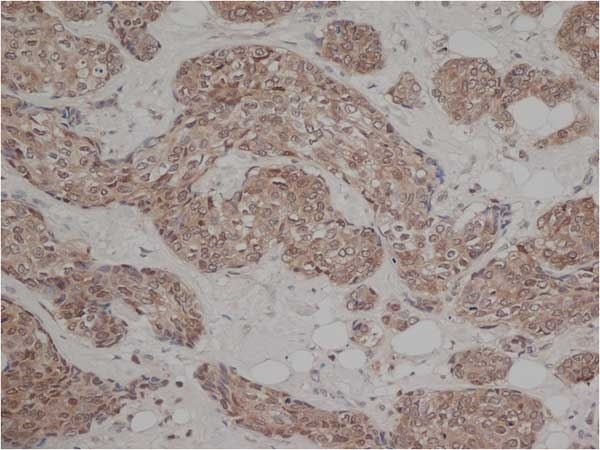 Mouse anti Human Estrogen receptor beta 1 antibody, clone PPG5/10 used for the identification of ERβ in cancer tissue by immunohistochemistry on formalin fixed paraffin embedded tissue sections. Prostate carcinoma Gleason score 3+3 showing > 70% positive nuclei stained by IHC for ER-b. 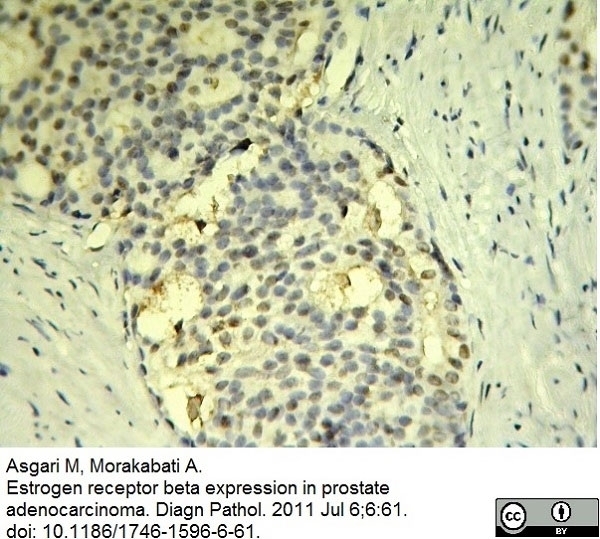 From: Asgari M, Morakabati A.
Estrogen receptor beta expression in prostate adenocarcinoma. Diagn Pathol. 2011 Jul 6;6:61. 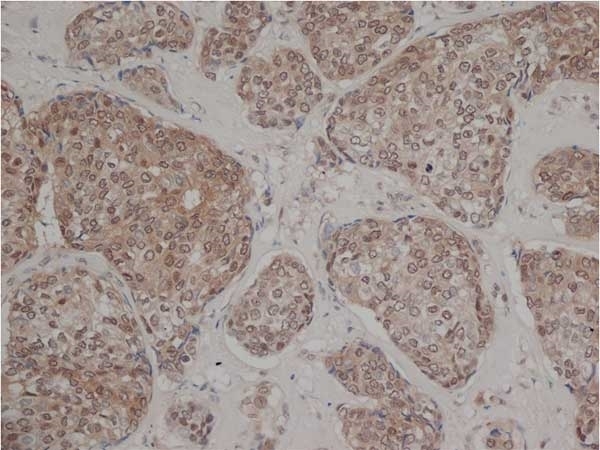 Mouse antiHuman estrogen beta 1 antibody, clone PPG5/10 used for the detection of ERβ1 expressing cells in cancer tissue by immunohistochemistry on formalin fixed, paraffin embedded tissue sections. 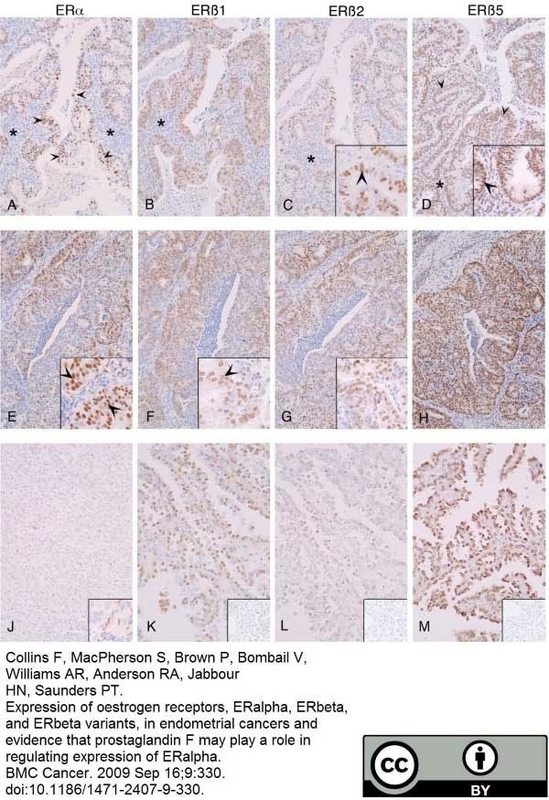 Morphology and immunolocalization of estrogen receptors (ERβ1, ERβ2) in seminoma, embryonal carcinoma and control testis. The pictures show representative samples. A, A1, A2: Haematoxylin-Eosin staining. B, B1, B2: ERβ1 immunolocalization. C, C1, C2: ERβ2 immunodetection. Scale bars = 12,5 μm. L, linfocytes. Lc, Leydig cell. Nc, neoplastic cell. Pc, plurinuclear cell. S, septa. T, seminiferous tubule. Inserts at the bottom right side (B, B1, B2, C, C1, C2): absorption controls. Scale bars = 12,5 μm. Inserts at the top right side (B, B1, C, C1): higher magnification of the pictures. Scale bars = 5 μm. From: Rago V, Romeo F, Giordano F, Ferraro A, Andò S, Carpino A. 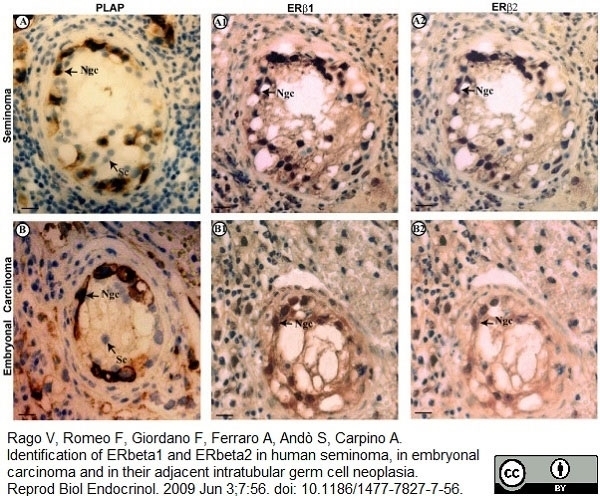 Identification of ERbeta1 and ERbeta2 in human seminoma, in embryonal carcinoma and in their adjacent intratubular germ cell neoplasia. Reprod Biol Endocrinol. 2009 Jun 3;7:56. doi: 10.1186/1477-7827-7-56. 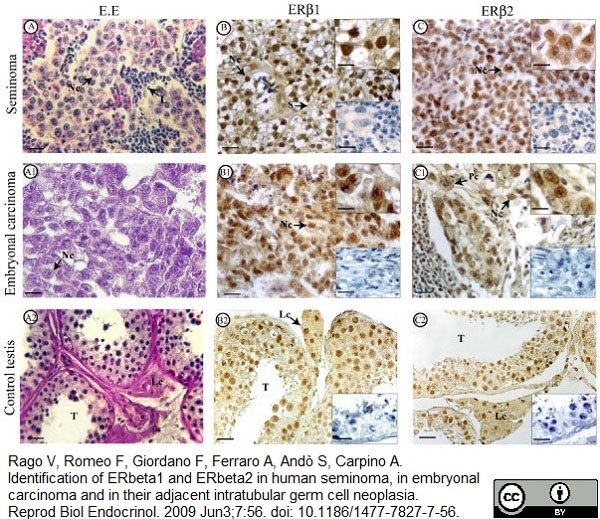 PLAP staining and immunolocalization of estrogen receptors (ERβ1, ERβ2) in intratubular germ cell neoplasia adjacent to seminoma (A) and embryonal carcinoma(B); the pictures show representative samples. A, B: PLAP staining. A1, B1: ERβ1 immunolocalization. A2, B2: ERβ2 immunodetection. Ncg, neoplastic germ cell. Sc, Sertoli cell. Scale bars = 5 μm. Mouse anti Human estrogen receptor beta 1 antibody, clone PPG5/10 used for demonstrating estrogen receptor beta staining in prostate cancer specimens by immunohistochemistry on formalin fixed, paraffin embedded microarray sections. Microscopic pictures of tissue micro array representing expression of aromatase, estrogen receptor (ER)α and ERβ by immunohistochemistry staining in PCa sections. Original magnification x40 showing low and high expression of ERα, ERβ and aromatase in in tumor cells (TE) and tumor associated stromal cells (TS) of PCa in addition to positive tissue controls (Pos.TC) and negative tissue controls (Neg.TC) for each antibody. Positive tissue controls; ERα – ovary, ERβ –colon adenocarcinoma and aromatase – placenta. Negative tissue controls; ERα – liver, ERβ and aromatase – pancreas. 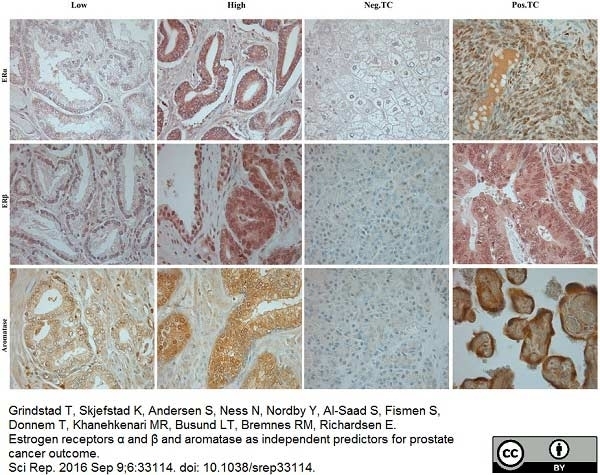 From: Grindstad T, Skjefstad K, Andersen S, Ness N, Nordby Y, Al-Saad S, Fismen S, Donnem T, Khanehkenari MR, Busund LT, Bremnes RM, Richardsen E.
Estrogen receptors α and β and aromatase as independent predictors for prostate cancer outcome. Sci Rep. 2016 Sep 9;6:33114. Mouse anti Human estrogen receptor beta 1, clone PPG5/10 (MCA1974) used for the evaluation of ERβ1 expression in endometrial cancer tissue by immunohistochemistry on formalin fixed, paraffin embedded tissue cestions. Immunoexpression of ERs in endometrial cancers. Tissues were classified as well (A-D), moderately (E-H) or poorly (J-M) differentiated; main panels show closely adjacent sections from three cancer blocks to allow direct comparisons. All proteins were immunolocalised to cell nuclei (see higher power inserts in panels e, f, c and d respectively). In the well and moderately differentiated cancers expression was most intense in epithelial cell layers (arrowheads, panel A and inserts). Note that ERα was low/absent in poor grade cancers (J) but immunoexpression of ERβ1, 2, 5 was readily detected (K. L, M). Inserts in panels K, L, and M show negative controls for ERβ1, ERβ2 and ERβ5 antibodies respectively generated using primary antibodies pre-absorbed with specific peptides used for immunisation. Asterisks (*) label the stromal compartment that was well defined in the well differentiated cancers. From: Collins F, MacPherson S, Brown P, Bombail V, Williams AR, Anderson RA, Jabbour HN, Saunders PT. 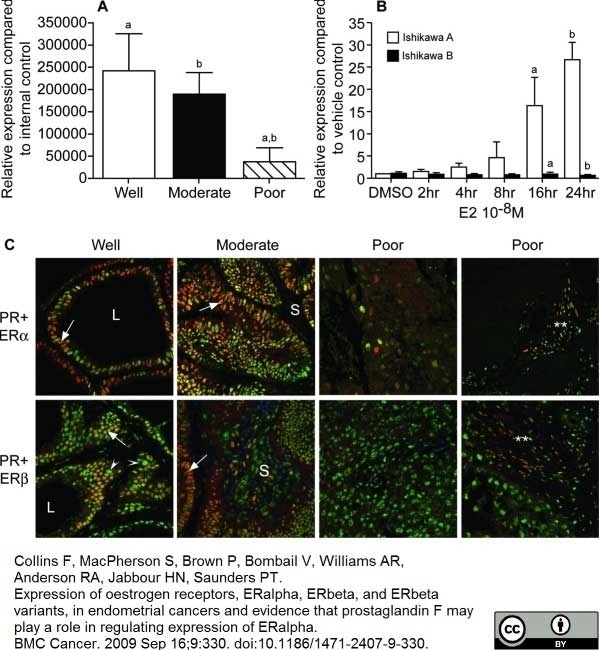 Expression of oestrogen receptors, ERalpha, ERbeta, and ERbeta variants, in endometrial cancers and evidence that prostaglandin F may play a role in regulating expression of ERalpha. Mouse anti Human estrogen receptor beta 1, clone PPG5/10 used for the evaluation of ERβ1 expression in endometrial cancer tissue by immunofluorescence on formalin fixed, paraffin embedded tissue cestions. Expression of PR paralleled that of ERα not ERβ. A. Expression of PR mRNA was significantly higher in cancers that were classified as well or moderately differentiated as compared with those with a poorly differentiated phenotype (p < 0.05, n = 10 cancers in each group, comparisons indicated by letters a, b). B. PR mRNA was significantly higher in Ishikawa A [ERα-positive] compared to Ishikawa B [ERα-negative] after incubation with E2 for 16 (a) or 24 (b) hours (p < 0.01). Values are expressed as mean +/- SD of three independent experiments performed in duplicate. C. Fluorescent co-localisation as carried out using antibodies specific for ERα or ERβ1 (both green) and PR (red). The cancers illustrated were classified as well (code 1614), moderately (code 1930) or poorly (c, codes 0001 and 1176) differentiated; at least 8 samples were analysed in each group. Co-expression was detected as yellow/orange immunofluoresence. In the well and moderately differentiated cancers expression of PR was most intense in epithelial cells and broadly overlapped with that of ERα (e.g. in cells indicated by arrows). Expression of PR was very low in the poorly differentiated cancers and appeared confined to cells with a fibroblast phenotype (**). Some ERβ1 positive cells were PR positive however most cells in the poorly differentiated cancers were ERβ1 positive and PR negative (green nuclei). Labels: L = lumen, S = stromal compartment, arrowheads = ERβ1 postive cells that are PR negative. Mouse anti Human estrogen receptor beta 1, clone PPG5/10 (MCA1974) used for the demonstration of ERβ1 expression in ovine fetal liver and kidneys by immunohistochemistry on formalin fixed, paraffin embedded tissue sections. Role of estrogen. Circulating estradiol levels in control (Cont) females (white bars) and males (black bars) and those exposed to TP quantified through RIA (A). Immunolocalisation of ERS1 in a representative liver (B) and kidney (C) in the d90 female fetus. Inset is negative control. Renal (light bars) and hepatic (dark bars) ERS1 expression in d90 females, whose mothers were prenatally treated with control oil (Cont) or TP (D). Values represent mean ±S.E.M. ** P<0.01. Scale bars represent 100μm. 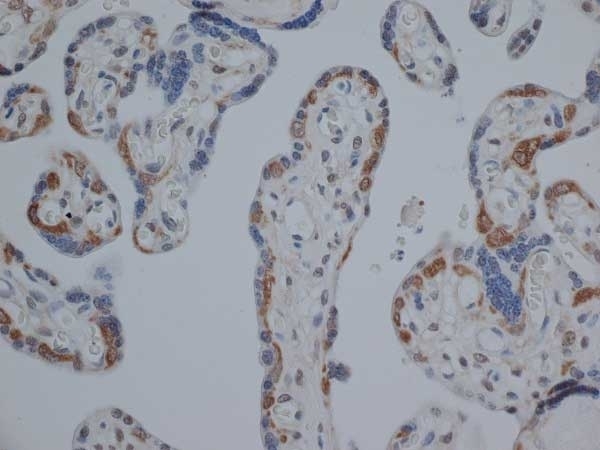 Mouse anti Human Estrogen β antibody, clone PPG5/10 (MCA1974S) used for the evaluation of ERβ expression in human thyroid tissues by immunohistochemistry on formalin fixed, paraffin embedded sections. Immunohistochemical staining of ERα and ERβ1 in PTC lesions and NTG tissue (400×). 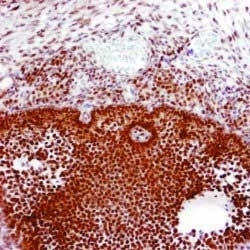 ERα and ERβ1 expression was analyzed by immunohistochemical staining of formalin-fixed and paraffin-embedded thyroid tissue sections from patients with papillary thyroid cancer (PTC) and those with nodular thyroid goiter (NTG) using specific antibodies and the Elivision™ plus two-step system. (A) NTG tissue with negative ERα staining; (B) NTG tissue with positive nuclear ERα staining (total score 6); (C) PTC tissue with negative ERα staining; (D) PTC tissue with positive nuclear ERα staining (total score 8); (E) PTC tissue with positive nuclear and cytoplasmic ERα staining (total score 7); (F) NTG tissue with negative ERβ1 staining; (G) NTG tissue with positive nuclear ERβ1 staining (total score 8); (H) NTG tissue with positive nuclear and cytoplasmic ERβ1 staining (total score 7); (I) PTC tissue with negative ERβ1 staining; (J) PTC tissue with positive nuclear ERβ1 staining (total score 6); (K) PTC tissue with positive nuclear and cytoplasmic ERβ1 staining (total score 7); (L) PTC tissue with positive cytoplasmic ERβ1 staining (total score 5). From: Huang Y, Dong W, Li J, Zhang H, Shan Z, Teng W.
Differential expression patterns and clinical significance of estrogen receptor-α and β in papillary thyroid carcinoma. BMC Cancer. 2014 May 29;14:383. Mouse anti Human estrogen receptor beta 1, clone PPG5/10 recognizes the estrogen receptor beta 1 (ERB1), one of several isoforms of estrogen receptor (ER) which can be used in conjunction with progesterone receptor (PR) and HER2/neu (CD340), to help determine both prognosis and the effectiveness of hormonal therapy, in breast cancer patients. Prognosis and survival rate varies greatly depending on cancer type, stage and treatment. 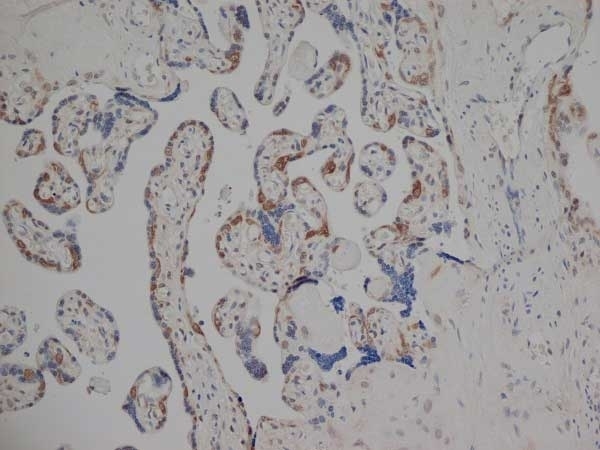 Mouse anti Human estrogen receptor beta 1, clone PPG5/10 is increasingly being utilized in the immunohistochemical staining of formal fixed paraffin embedded tissue, in preference to ligand binding assays, for the detection of ER/PR. ER/PR is present in approximately 75% to 80% of breast tumors, and breast cancer cells with these receptors depend on the hormones estrogen and/or progesterone to grow (Saunders, P. et al., 2002 and Nelson, A.W. et al., 2017). Mouse anti Human estrogen receptor beta 1, clone PPG5/10 can be used to demonstrate the nuclear presence of ERB1 within cells of the breast (Shaaban, A.M.et al., 2008), ovary, uterus, oviduct, testis, prostate, bladder and male reproductive ducts. BE ADVISED: Publications (Nelson, A.W. et al., 2017 and Andersson, S. et al., 2017) have queried the validity of clone PPG5/10. Please refer to the references section of this product's web page or datasheet for further information. Synthetic peptide sequence CSPAEDSKSKEGSQNPQSQ from the C-terminal region of the human estrogen receptor beta 1 isoform. 0.05M glycine/EDTA pH8 see (See Carpino et al.) or sodium citrate buffer pH 6.0 are recommended for this purpose. 0.05M glycine/EDTA pH 8.0 see (See Carpino et al.) or sodium citrate buffer pH 6.0 are recommended for this purpose. Moore, J.T. et al. (1998) Cloning and characterization of human estrogen receptor beta isoforms. Biochem Biophys Res Commun. 247 (1): 75-8. Torlakovic, E. et al. 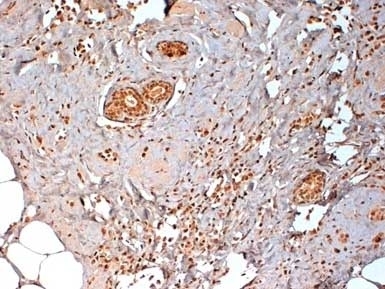 (2002) Prostate carcinoma expression of estrogen receptor-beta as detected by PPG5/10 antibody has positive association with primary Gleason grade and Gleason score. Hum Pathol. 33 (6): 646-51. Saunders, P.T. et al. (2002) Expression of oestrogen receptor beta (ERbeta1) protein in human breast cancer biopsies. Br J Cancer. 86 (2): 250-6. Schiessl, B. et al. (2005) Expression of endothelial NO synthase, inducible NO synthase, and estrogen receptors alpha and beta in placental tissue of normal, preeclamptic, and intrauterine growth-restricted pregnancies. J Histochem Cytochem. 53 (12): 1441-9. Wong NA et al. (2005) ERbeta isoform expression in colorectal carcinoma: an in vivo and in vitro study of clinicopathological and molecular correlates. Fixemer, T. et al. (2003) Differential expression of the estrogen receptor beta (ERbeta) in human prostate tissue, premalignant changes, and in primary, metastatic, and recurrent prostatic adenocarcinoma. Wood, C.E. et al. (2006) Hyperplastic and neoplastic lesions of the mammary gland in macaques. Vet Pathol. 43 (4): 471-83. Juengel, J. L. et al. (2006) Oestrogen receptor alpha and beta, androgen receptor and progesterone receptor mRNA and protein localisation within the developing ovary and in small growing follicles of sheep. Bianchi, C. et al. (2010) Endometrial population of oestrogen receptors alpha and beta and progesterone receptors A and B during the different phases of the follicular wave of llamas (Lama glama). Reprod Domest Anim. 45 (5): 872-80. Marotti, J.D. et al. (2010) Estrogen receptor-beta expression in invasive breast cancer in relation to molecular phenotype: results from the Nurses' Health Study. Saunders, P.T. et al. (2000) Differential expression of estrogen receptor-alpha and -beta and androgen receptor in the ovaries of marmosets and humans. Biol Reprod. 63 (4): 1098-105. Asgari, M. and Morakabati, A. 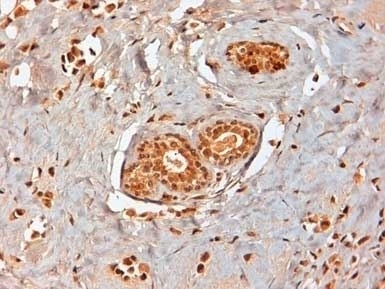 (2011) Estrogen receptor beta expression in prostate adenocarcinoma. Fowler, P.A. et al. (2011) Development of steroid signaling pathways during primordial follicle formation in the human fetal ovary. J Clin Endocrinol Metab. 96: 1754-62. Mafuvadze, B. et al. (2011) Apigenin Prevents Development of Medroxyprogesterone Acetate-Accelerated 7,12-Dimethylbenz(a)anthracene-Induced Mammary Tumors in Sprague-Dawley Rats. Cancer Prev Res (Phila). 4: 1316-24. Silvestri, A. and Fraser, H.M. (2007) Oestrogen and progesterone receptors in the marmoset endometrium: changes during the ovulatory cycle, early pregnancy and after inhibition of vascular endothelial growth factor, GnRH or ovariectomy. Bombail, V. et al. (2008) Estrogen receptor related beta is expressed in human endometrium throughout the normal menstrual cycle. Nagai H et al. (2015) Pulmonary Macrophages Attenuate Hypoxic Pulmonary Vasoconstriction via β3AR/iNOS Pathway in Rats Exposed to Chronic Intermittent Hypoxia. PLoS One. 10 (7): e0131923. Leska A et al. (2015) Estradiol concentration and the expression of estrogen receptors in the testes of the domestic goose (Anser anser f. domestica) during the annual reproductive cycle. Domest Anim Endocrinol. 51: 96-104. Faustino-Rocha, A.I. et al. (2016) Effects of lifelong exercise training on mammary tumorigenesis induced by MNU in female Sprague-Dawley rats. Grindstad, T. et al. (2016) Estrogen receptors α and β and aromatase as independent predictors for prostate cancer outcome. Skjefstad K et al. (2016) Prognostic relevance of estrogen receptor α, β and aromatase expression in non-small cell lung cancer. Gynecol Oncol. 150 (1): 158-165. Nelson, A.W. et al. (2017) Comprehensive assessment of estrogen receptor beta antibodies in cancer cell line models and tissue reveals critical limitations in reagent specificity. Mol Cell Endocrinol. 440: 138-150. Andersson, S. et al. (2017) Insufficient antibody validation challenges oestrogen receptor beta research.